Pop Culture Junk Mail: Awaiting "Connect Four: The Movie"
Awaiting "Connect Four: The Movie"
I posted that "Stretch Armstrong" was going to be a 2011 movie, and people on my Facebook page were all over it, suggesting movies based on Weebles, Lip Smackers, Etch-a-Sketch and more. But we thought we were being FUNNY. Turns out that Peter Berg is on board for "Battleship: The Movie" in July 2011, and it's just part of a deal with Hasbro in which "Clue," "Candyland," and "Ouija" will ALL BECOME MOVIES. Oh man, they better use the "You sank my battleship!" line. 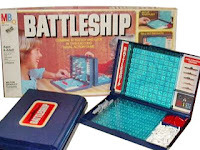 I actually just watched my niece and her boyfriend play electronic Battleship, It is very different from the cheapie of my youth...it actually talks and makes shooting sounds. She tells me they once had a version with a squirt gun, and with each turn, you rotate it to point at the other player. If their ship gets sunk, they get squirted. But...Clue IS a movie. And it's awesome! And I can totally see Candyland as a kids fantasy-adventure film. I mean...it would have to be better than G-Force, wouldn't it? Clue is already a movie. I think there is a movie called "Ouija". A very bad 70's or 80's made for television version, I think. I am thinking Spirograph... A Japanese horror movie where a young girl's designs spell doom for some poor unlucky sap.